Instructions for building the vortex in a bottle, a device that produces a vortex like the one found in a bathtub drain. The device is completely self-contained and can be used in any classroom setting. It is simple enough and cheap enough for students to build their own to take home. A brief explanation of the physics of vortices is included. The vortex bottle is like having a portable bathtub drain for your classroom. Fig. 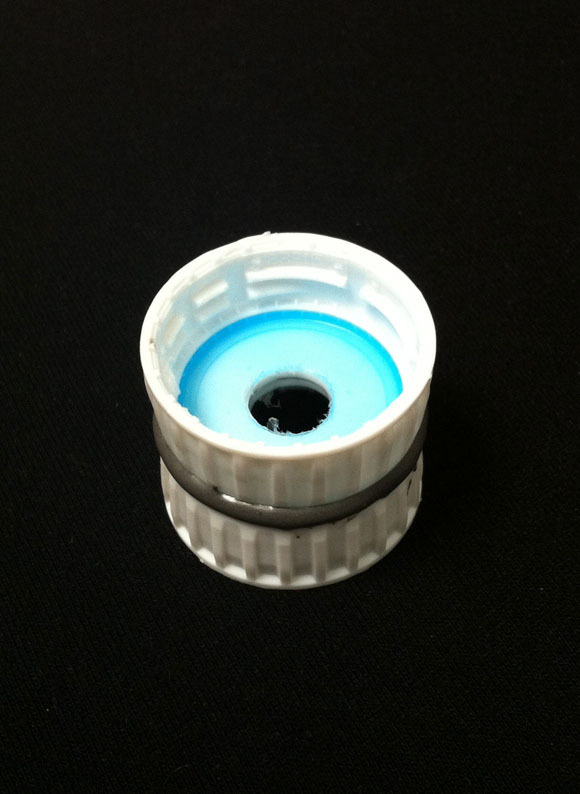 1: Two bottle lids epoxied together with a hole drilled in the center. This construction will form the connector between the two bottles of the vortex bottle. Fig. 2: The vortex bottle in action. 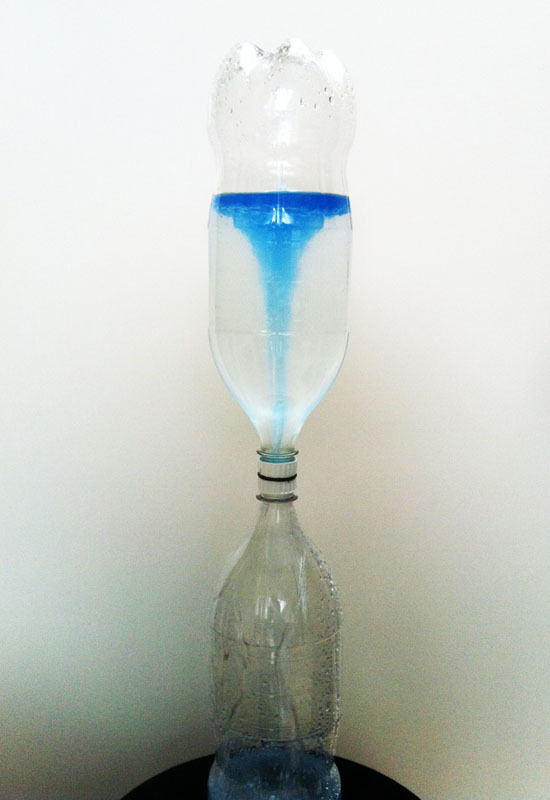 The water in the upper bottle is rotating in a vortex while draining into the lower bottle. Air comes up through the eye of the vortex to replace the falling water. A small amount of blue lamp oil, which floats on the surface of the water, helps show the outline of the vortex. To make the device in the video, use two empty soda bottles with lids. Put a thick layer of glue on the top of one lid. Epoxy or hot glue usually works best. Press onto the other lid as shown in figure 1 and let dry. The seal between the lids must be leak proof. Add more glue and duct tape around the sides if necessary. Drill or poke a hole all the way through the center of the lids, about 3/8" (about 1 cm) in diameter. Make sure you don't break the glue seal. Fill one bottle with water and attach the lids. Attach the other empty bottle upside-down on top and turn the whole contraption over. Now take hold of the bottles and swirl them around in a circle to get the water moving. The water will start draining into the lower bottle, and a funnel-shaped vortex should form (figure 2). When the water starts moving in a circle, it presses up against the outside of the bottle. This behavior is a consequence of Newton's first law of motion, which states that objects (including water droplets) will move in a straight line unless there is some force pushing on them. In this case the force comes from the sides of the bottle. The water moves in a straight line until it presses up against the sides of the bottle and is redirected. In the neck of the bottle, the water presses to the outside of the hole, distributing more weight to the outside and less weight in the center of the hole. This imbalance allows water to start draining down at the edges of the hole, and air to start bubbling up in the center. Soon, the water forms a funnel against the outside of the bottle as air flows up through the center. where $F$ is the force, $m$ is the mass of the drop, $v$ is the velocity of the drop, and $r$ is the radius of the circle. The smaller the circle and the faster the speed, the more force is required. Therefore, as the radius goes down and the speed goes up, the required force goes up. For droplets on the perimeter, this force is supplied by the sides of the bottle. For droplets closer to the center, this force must be supplied by collisions with other droplets on the outside. This means the pressure of the water must go up at smaller radius. At some point water droplets on the outside cannot provide any more pressure to droplets on the inside1, and the inside droplets will not be able to move to a smaller radius. When this happens, the water reaches a minimum radius, and an eye opens in the center. You've probably seen the same effect in a bathtub drain. When you pull the plug in the bathtub, the water often forms a vortex as it drains. In this case the rotation of the water is caused by the movement of the bather, however slight, which sets the water stiring in one direction or the other. Stir the water consistently in a single direction if you want the vortex to form more rapidly. Note for geeks: It is commonly thought that the Coriolis force determines the direction of rotation as the water goes down the drain. This "fictitious force" is the result of the rotational motion of the earth, and would cause draining water to rotate counter-clockwise (as viewed from above) in the northern hemisphere, and clockwise in the southern hemisphere. Although theoretically the Coriolis force does have an effect on draining water, the magnitude of the force, which depends on the speed of the water and the latitude of the bathtub, is far too weak to have a noticeable effect. In contrast, the Coriolis force does play a dominant role in the formation of hurricanes and tropical storms, for which the extent of the storm and the high wind speed produce a significant Coriolis effect. If you don't want to glue and drill your own bottle lids, there is a commercial connector that does the same thing and is a little sturdier. It goes by the name of "tornado tube" or "cyclone tube" and generally sells for a few dollars. Many science and toy stores carry it. Check the equipment link at the top of this page for some suggested vendors. 1. The pressure of water is caused by collisions between water molecules. The force of these collisions depends on the temperature of the water (which determines the average speed of the collision) and the density of the water (which is generally constant).